1) The interior of Piece, you can’t see much of it, but the ceiling looks like the bottom of a ship (or at least I think it does). 2) The menu. 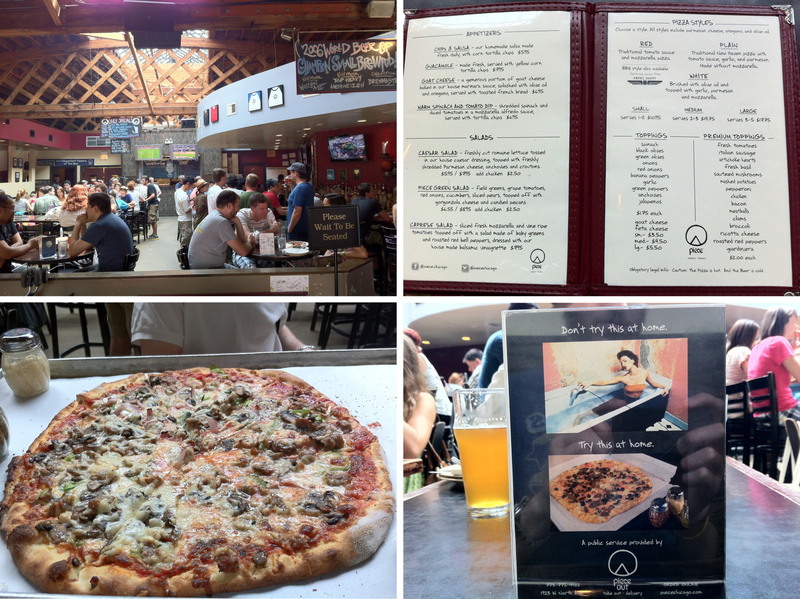 It was a little pricey, but that’s to be expected in a trendy Chicago Brewery and Pizzeria. 3) An advertisement for their takeout. well done, Piece. If you can’t read it, click on the picture, and a larger image will open up in a new tab or window. If you look closely you can also see my hands, face, and shirt in the reflection. 4) Our lunch/dinner. We got a traditional medium pie with red onions, green peppers, italian sausage, and sautéed mushrooms. I know I’ve said that I’m not a big fan of italian sausage because of the fennel seeds, but I don’t think I tasted one on Saturday. Alex and I managed to eat the whole thing save for one small sliver of a slice. It was quite good, but the $22.25 price tag for a medium pizza does seem a little ridiculous. To their credit, the rent that they have to pay at the location they’re in is probably much higher than a place in Madison. We jumped on the L at Division, and took it to the Jackson stop, where we transferred to the red line. 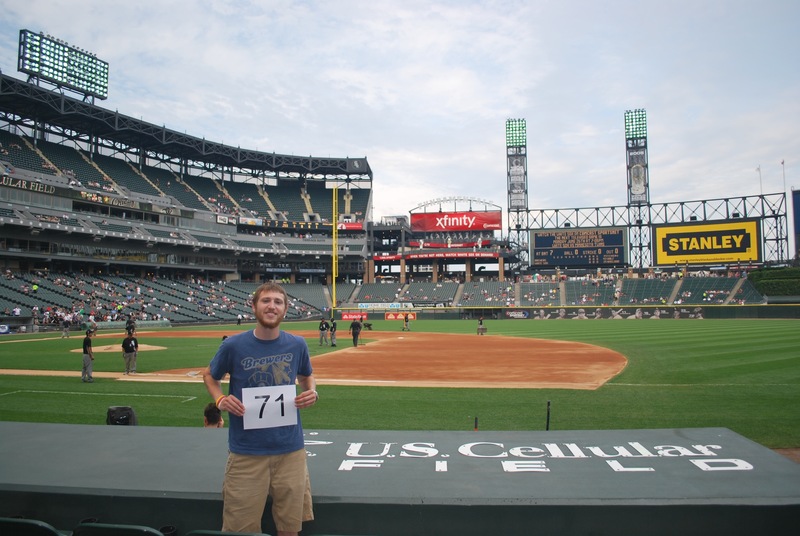 We got to the Sox-35th stop just before 4:45, and were in front of the Cell a few minutes later. We walked around for a bit and found where home plate at Comiskey Park used to be. 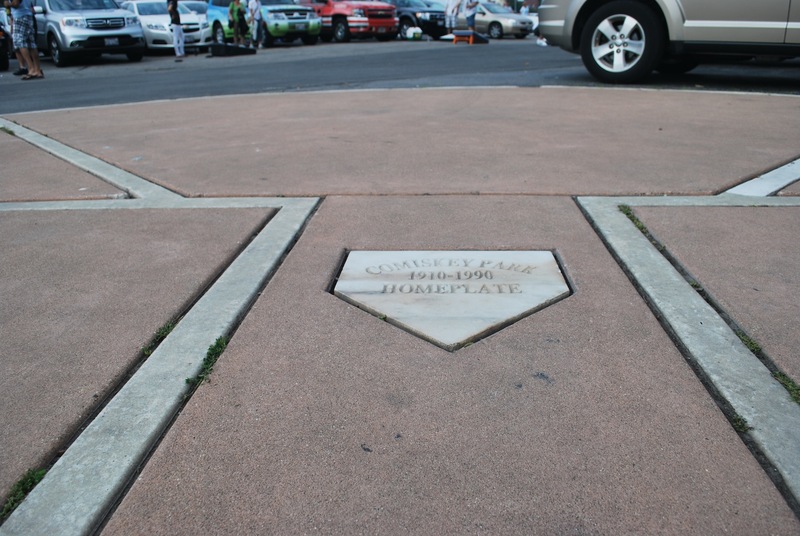 They commemorated it with a marble home plate at the site of the original. We got inside around 5:10 and waited until batting practice was over. After they removed the protective tarps from the field we went down to get game photo number 71. You can see in the background that they were getting the field ready for the game. 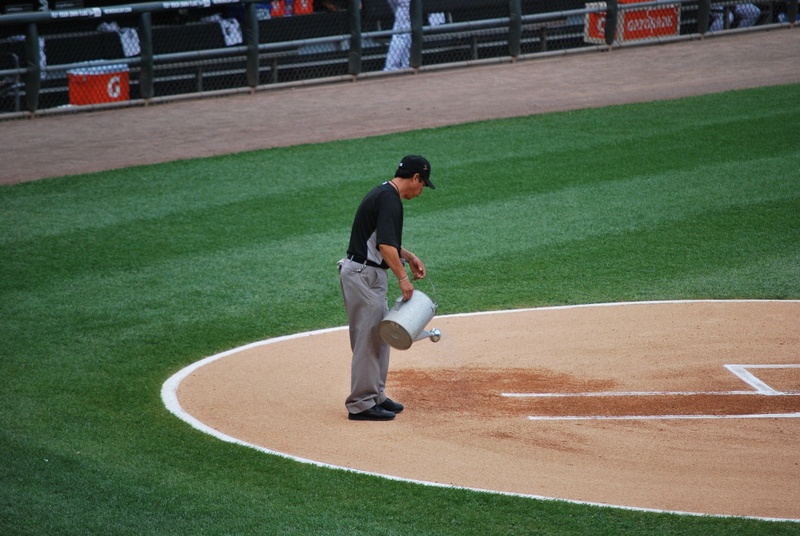 At the Cell readying the field apparently involves meticulously watering around the chalk lines of the batters box. I know a lot of teams probably do this, but I just think it looks silly with the watering can and all. While we waited for the game to start I let Alex take some pictures with my camera. This was one that he took. I’m not sure what they’re doing, but the trainer is winning… (I know he is stretching the guys’ hamstring, but just play along). The game started and I couldn’t help but to take a picture of the White Sox’s starting pitcher. Here he is throwing the second pitch of the ballgame to Norichika Aoki. Just how sweet of a last name is Axelrod? Even if he doesn’t have a successful big league career, he’ll still have that sweet*** last name to fall back on. The Brewers got on the board in the bottom of the second inning when Kottaras doubled to left. 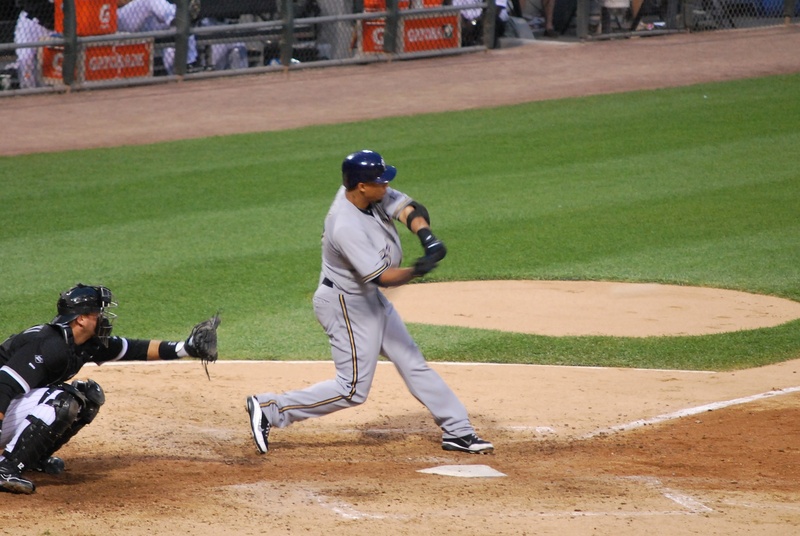 A misplay by the Sox’s left fielder allowed Aramis Ramirez to trot home. Here he is just milliseconds before he touched the plate. Cody Ransom (the on deck batter) has his hands up to tell Ramirez that he doesn’t need to slide. The on deck hitter will position himself in line with the route of the runner, and let them know if they need to slide, and maybe even what type/where they should slide. In the second inning the White Sox took a 2-1 lead when they got back-to-back one out RBI singles from Viciedo and Alexei Ramirez. The Brewers came back in the third and tied it on an RBI single from Braun. 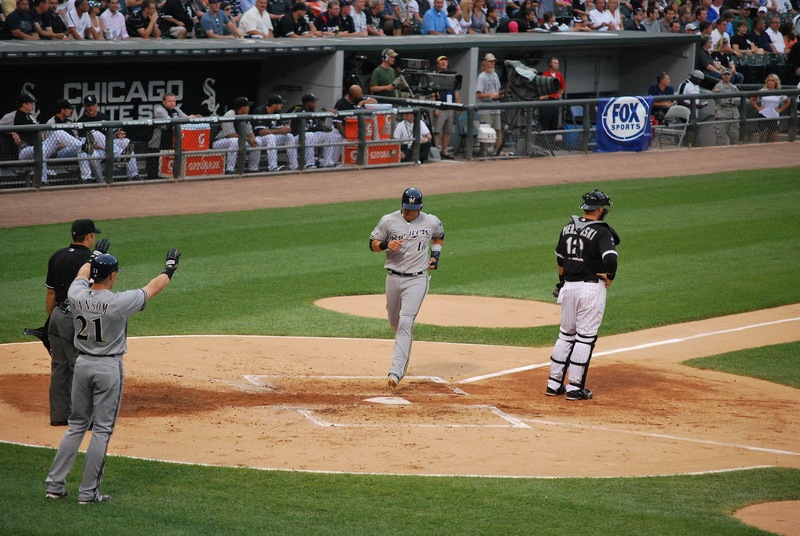 In the bottom of the fourth the White Sox again went in front (4-2), this time on a two-run home run from Viciedo. The Brewers scored one in the fifth on an RBI single from Nyjer Morgan, then three more in the sixth to take a 6-4 lead. RBI singles by Maldonado and Ransom accounted for the first two runs in the sixth, and a sacrifice fly from Gomez the final run. This next picture is of Gomez, just before he connected on the sacrifice fly. I don’t know why, but his bat and the ball are almost unidentifiable. If you click on it and look closely you can see the bat and the ball, but they are both pretty hard to see. I labeled it “Gomez without a bat?” because if you just glance at it that’s what you’d think. The scientific reason for their appeared disappearance is the speed of the bat and the ball, the slow shutter speed (1/160th of a second), the lighting, and the fact that both his bat and the ball are relatively light objects to begin with. The White Sox weren’t done scoring (unfortunately) and they scored two runs of their own in the sixth, then solo runs in the seventh and eighth. Final Score: White Sox 8 – Brewers 6. It was a tough one, and Randy Wolf just can’t buy a win right now. He didn’t pitch the best, but he gave the Crew a chance to win. Again the bullpen let him down, but that’s baseball, it happens. I have to mention the guy behind me and Alex because he was obnoxious. From the starting lineup announcements we could tell we were probably going to be annoyed by the end of the game. We were spot on. I’m not sure if he was with his girlfriend, or just a girl that was a friend, but it seemed like he was trying to impress her with his baseball knowledge. Corey Hart made a scoop on a bad throw early in the game, and he said it wasn’t a hard play. I told him that Hart has been in the outfield for the last seven or so years. He then wondered aloud why Prince wasn’t starting at first. I told him that Prince was with the Tigers now. He said “Oh, I didn’t know, I haven’t paid attention to Milwaukee the past 10 years.” We then told him that Detroit is in the White Sox division (the AL Central). I think he responded with something like “well I don’t pay that close attention”. It was a major signing for an intra-division rival, so I’m not sure how he missed it. Later in the game we heard him say that Minnesota was losing, “like they always do”, so he must be somewhat up to date to know that the Twins aren’t very good this year. Late in the game the girl he was with asked if a 3-2 count was a full count and he said yes. She then asked if it was still a full count if it was a 3-2 count with 2 outs. He said yes to that as well, but then said “but it’s more dangerous.” I have no idea what that meant, but now this poor lady is going to be ducking for cover every time there’s a 3-2 count with 2 outs at a baseball game. Ok, maybe not, but still… He also chanted HGH every time Braun came to the plate, which was pleasant. Alright, I’ll stop ranting now. I’ll be leaving for the game in less than 11 hours, so I’m calling it a night. I’m leaving from the park tomorrow, and driving right to Cincinnati, and I’m hoping to get there by 10:00 pm eastern time. I’m staying with a former hotdogger that Victoria is friends with. I probably won’t get the post up for Sunday until Monday afternoon. We’ll see how I feel when I’m done driving.